Electrical engineering, industrial design, aerospace, and photoscience; these are our roots. The fundamentals of each discipline governs the development of our products and the growth of our company. And we’re curious by nature. We enjoy finding solutions that make things work well and last a long time. Evluma designs its products from the ground up rather than using derivatives of older HID or LED systems. Because of our unique approach to providing the lowest cost of ownership in the industry, we design our own drivers, surge protection systems, photocontrols, lighting controls and more. This allows Evluma engineers to perfectly match components and functionality and maximizes the cooperative benefits of each interrelated and custom subassembly. Photocontrol Failsafe™ maintains normal dusk-to-dawn operation of an AreaMax or OmniMax automatically should the photocontrol fail. Each luminaire is factory programmed with the customer’s location and NIST dusk-to-dawn timetables in UTC (Coordinated Universal Time). Once a photocontrol is installed (Evluma integrated or other) these products have the ability to verify dusk-to-dawn for their unique service location and to maintain operation when and if the photocontrol should fail. For a complete explanation of how Photocontrol Failsafe™ operates, please see our Technical Bulletin. Evluma understands what it takes to make dynamic, maintenance-savings products that communicate – products that are ‘smart.’ Our roots run deep. As one of the founding members of Intermec, Evluma Chief Scientist John Renn is also known for developing the first integrated bar code scanner in a hand held wand, in addition to a wide range of barcode symbologies, the heart of early industrial automation. Sensor connecting, real-time machine control, operator/machine interfaces and multi-tasking operating systems, our team has done it. With trusted colleagues, Renn and Reed laid Evluma’s past foundation in best-in-class automation and communication technologies, an industry that now, today, includes the Internet of Things. This is the origin of ConnectLED™, a BLE (Bluetooth Low Energy) application that allows owners to control, query and dim Evluma products. With the AreaMax, Evluma has combined a textured glass lens and a white, optical-grade reflective film liner to create a bright, diffuse light. As a Recognized Winner for Residential Roadway Lighting in the 2013 Outdoor Next Generation Luminaires (NGL) Solid-State Lighting Design Competition, the judges “appreciated the excellent glare control” of the 40W AreaMax, noting “that it would be particularly well suited for residential applications.” Advocating for a reduction in light pollution, Evluma offers a Dark-Sky Friendly AreaMax with a flat lens resulting in no light above 90%, and a U0 BUG rating. Additionally, light trespass may be easily curtailed through the use of the AreaMax LTS (Light Trespass Shield) mountable in three different positions and/or dimming with ConnectLED with brightness settings between 100-20%. The OmniMax includes a revolutionary molded silicone lens with matte finish for maximum light diffusion, reducing glare in pedestrian environments where light quality can meet stringent esthetic judgements. The patent-pending, radial placement of LEDS in the novel light engine emulates the burn center of legacy HID bulbs enhancing familiarity and visual comfort. A driver designed to last 20 years requires high surge capacity, quality components, and the ability to maintain its surge rating over the extremes in temperature that outdoor lighting can encounter. Properly rated and well matched components have a profound effect on longevity. While we require our surge protection to handle the highest 20KV/10KA, ANSI/IEEE C62.41.2-2002 rating – Category C, Level H, MOVs (Metal Oxide Varistors) can wear from the multitude low level surges that can occur over years of use. Consequently, we use components tested to endure over 1 million 100amp surges. Evluma’s replaceable surge board offers three such MOVs. In addition, the surge board is fuse-protected safeguarding your investment and reducing the risk of propagation down the line in the event of lightning or other catastrophic event. Category C locations can produce large electrical fields and build up static electric charges in the housing of ungrounded outdoor luminaires. A patented Evluma system bleeds off externally induced voltages keeping the AreaMax, (the LEDS and the installer) safe. When comparing surge device ratings, it should be noted that a 20KV system like ours has 4 times the energy dissipation capacity, measured in joules, of a 10KV system used by many of our competitors. The S3 socket option is a popular choice when changing out HID lighting to the LED AreaMax. Our gentle-on-the-photocontrol electrical design encourages the reuse of your old photocontrol. Using the photocontrol as a sensor only, we’ve eliminated its role in switching the mains, creating a long-life environment for your recycled photocell. Supported by Photocontrol Failsafe™ future maintenance requirements are eliminated. The Evluma (patent pending) integrated photocontrol (P Option) has no contacts to fail, a lens made from extra-think, UV-stabilized polycarbonate in a shape and thickness designed to break up hail and ice and an industrial strength, wide temperature range silicon O-ring. 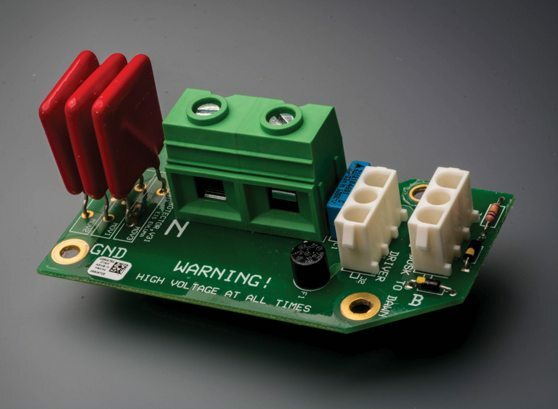 Your photocontrol is always protected two-fold – sensors are protected from surges by being powered through the surge board and made fully redundant thanks to Photocontrol Failsafe. Evluma’s propriety driver includes ‘ballast grade’ components carefully selected and purchased from only authorized distributors to avoid substandard or counterfeit parts. Operating conditions directly affect the life of electrolytic capacitors. Temperature and current derating increases capacitor life. But even over calculated Load Life, capacitors can drift out of spec. Planning for long life, we did the math and implemented parts with twice the capacitance required for proper circuit operation. We also encapsulate the driver in soft, thermally conductive silicone which not only conducts heat out to the AreaMax housing (see also Thermal Management), but supports the capacitors and other components to prevent vibration induced failures. Providing added safety to installers, the AreaMax is galvanically isolated from the power line by our propriety Class II driver. Heat is detrimental to the performance of LEDs. This is where over two decades of thermal management experience really pays off. The solution is complex and never out of the box. For the AreaMax it involves the careful selection of thermally conductive materials combined with a housing design that draws heat away from the LEDs. Thermal management protection circuity controls current levels to the LEDs based on temperature safeguarding against extremes. Many of these same field tested precautions are used in the OmniMax. With the addition of a high-end fan (the same used by BMW and Lexus) the OmniMax is suitable for enclosed luminaires. It’s about more than being lightweight and durable. A housing design effects important issues like thermal management and EPA. The Effective Projected Area (EPA) of a luminaire is the measurement of drag coefficient (or wind resistance) and used in the lighting industry to determine the amount of force a luminaire will apply to the mounting hardware and pole at a given wind velocity. The AreaMax weighs less than 8lbs and has an EPA under 0.5 sq. ft.